The brand name of the paint isn’t as important of a choice as the grade of any particular brand. Every paint manufacturer has a “builder’s” or “contractor’s” grade of paint, which will be their cheapest. It will also possibly require more coats to cover a wall effectively, and it will certainly degrade more quickly if exposed to weather. Whichever brand of paint you choose, find out the name of their cheapest grade and names of their better grades. Choose one of them to use, throughout your house. I advise avoiding the cheapest grade. 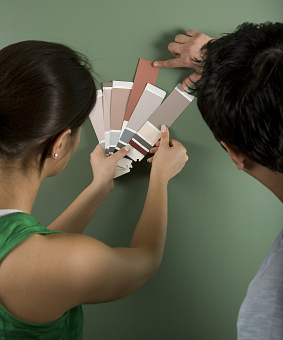 The three most common types of wall paint finish are flat, satin, and eggshell. It’s merely a matter of preference which type of finish you choose. But keep in mind that imperfections in the wall surface (and it’s likely that there will be some) are more likely to show with satin or eggshell. Having to do some paint touchup of finished walls is inevitable. Touch ups with satin and eggshell usually do not blend into the rest of the wall. The touched up spot shows, and this means you’ll have to repaint the entire wall if you want a uniform look. That’s why I charge a premium to house buyers who choose satin or eggshell finish. We usually end up repainting entire walls and painters charge for that. A flat finish, however, allows spot touch up which usually blends perfectly and is invisible.